It’s not often that I get to New York City, so when an opportunity to go “on the cheap” came up, I grabbed it. Oh sure, I brought my computer and will be doing a little work while I’m here, but mostly it’s a for-fun trip that will include checking out the nearby thrift stores in Chelsea and West Village. 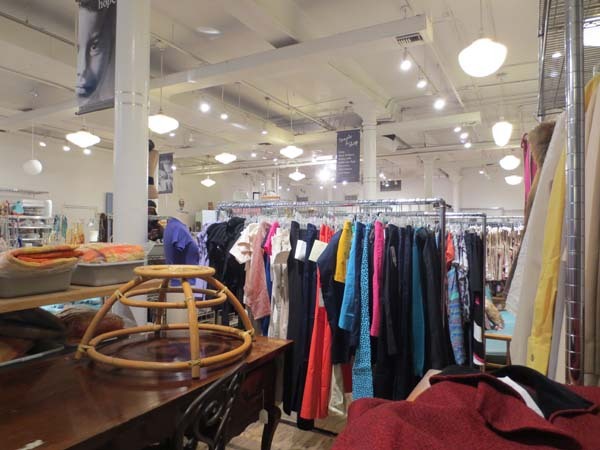 On a cold, rainy Monday I headed out to Housing Works (W. 17th St.), Angel Street Thrift Store (W. 17th St.) and Salvation Army (8th Ave.) and had three very different experiences. 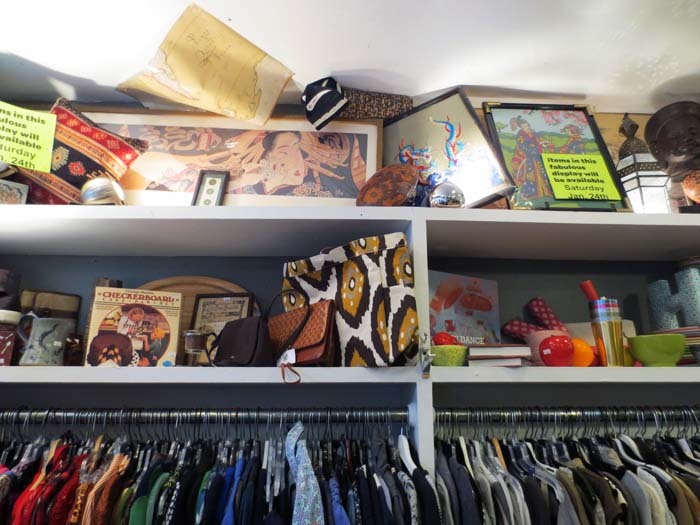 Walking into Housing Works is like walking into your favorite boutique. It is bright, clean and pleasing. I thought all this poshness would equate to higher prices. Au contraire! Prices were better than my grungy neighborhood Goodwill in Silicon Valley. Found two designer women’s blazers here. Next, I went across the street to Angel Street Thrift Store. Also pretty darn nice. Found a funky handmade pitcher but at $36 I passed. Did find an amazing ’50s women’s wool jacket. I went up to the counter that was manned by two bored looking young women texting and asked one clerk if there was any “wiggle room” in the price. Barely looking at me she answered, “We don’t negotiate prices.” Well, all righty then. I still bought the jacket because it was all kinds of fabulousness and in perfect condition…or so I thought. I did discover one small hole on the sleeve when I got back to the hotel. Hoping I can fix it with a few stitches, but will have to disclose this when I sell it. 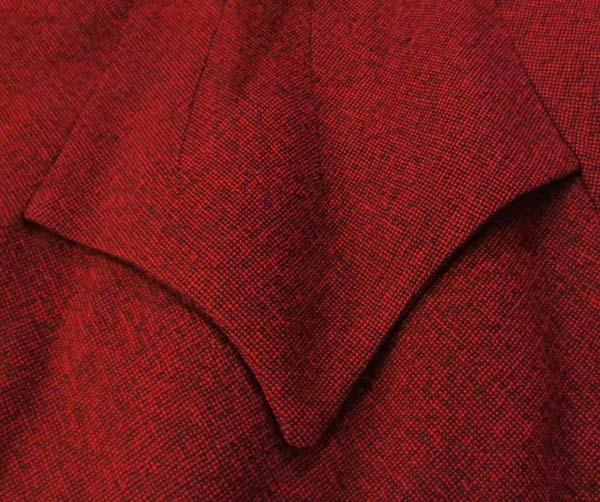 Here’s the faux pocket detail on the vintage jacket. Now the Salvation Army Thrift Store was about as sad as a store gets. Run down linoleum flooring, harsh lighting, no thought given to aesthetics, a bit of a mess really. But I did find a couple of vintage books (love vintage psychology books and who’s ever heard of Otto Fenichel?) and an ’80s Sasson jacket. Wednesday brought two more thrift store visits. Another Housing Works (W. 10th), which was small but had good stuff. Alas some items were not available for purchase till January 24th! Nuts! All the pieces on the top shelf aren’t for sale yet!!! 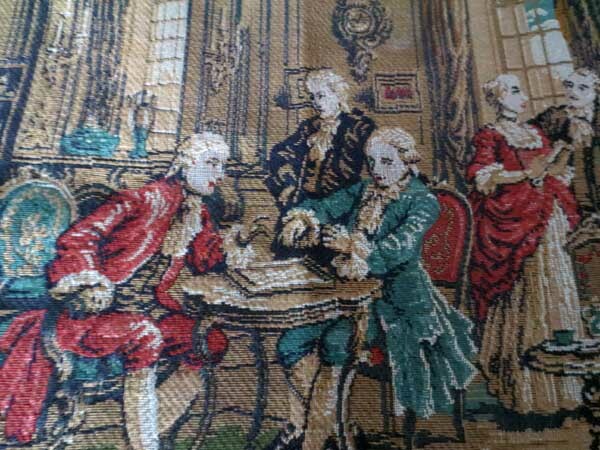 I did find a little tapestry made in Spain that has an Old World appeal that some folks love. 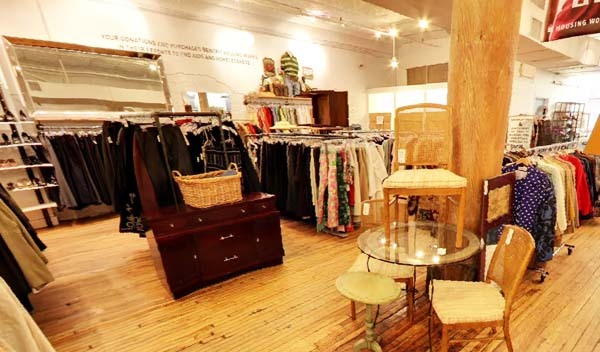 Wanted to go to West Village Thrift (W. 10th) across the street but it wasn’t open, so I popped down to St. Luke’s Thrift Store (Hudson Street)–a small, basement parish store run by friendly older women. Definitely work a visit. Splurged on a stone necklace (maybe green agate, maybe aventurine) that had been in a locked case. The stones are HUGE. It was just too cool to pass up. Hoping to make a little money on it. How about you? Any good thrift store finds?